Facundo Fernandez Zuccarelli gives us a behind-the-scenes look at how he created a low poly, pixelated scene inspired by The Simpsons. Hi! My name is Facundo, perhaps better known as Funkfz. 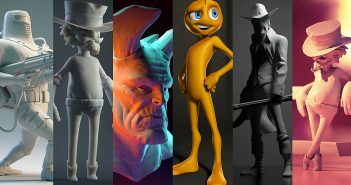 I am a 3D generalist from Buenos Aires, Argentina. I started doing 3D four years ago, learning from YouTube, Facebook and other web sites. I am always trying to push myself to learn new things and avoid staying on the same thing for a long time. Some weeks I try to improve my modeling, then my texture work, then my animation skills, all with the objective of being a better artist. If you want to see more of my work you can follow me on Instagram.